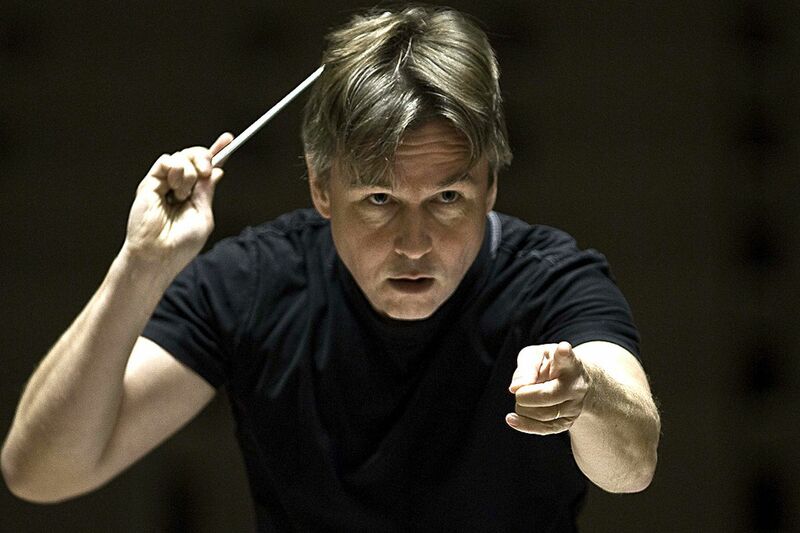 Esa-Pekka Salonen will guest-conduct the Philadelphia Orchestra. “Out of that sentence, I’m ready to become an old man, even a grandpa, but grandeur in all things I find off-putting and boring,” said Salonen, who is this week’s Philadelphia Orchestra guest conductor. He is fitting his Thursday through Saturday concerts at the Kimmel Center into a dense winter schedule that includes a world tour with his current orchestra, the Philharmonia Orchestra of London and a huge Stravinsky festival with his alma mater ensemble the Los Angeles Philharmonic. That doesn’t even account for his unimaginable plans for when he takes over the San Francisco Symphony from Michael Tilson Thomas in 2020. The still-boyish Salonen — who wears a characteristic black T-shirt seen in the 2014 ads he made for Apple’s iPad Air — has assembled a think tank for his San Francisco gig, including composer Nico Muhly, jazz artist Esperanza Spalding and, most radical of all, robotics expert Carol E. Reiley, who normally works in space exploration and self-driving cars. For the moment, though, he's absorbed in the more traditional Richard Strauss tone poem Also Sprach Zarathustra, which he'll conduct at this week's Philadelphia Orchestra concert, and might seem to contradict his anti-grandeur policy in the opening moments that were employed so memorably in the classic film 2001: A Space Odyssey. But Salonen is also a composer, and one who views Strauss from the inside out. And that side of him is astounded by how Zarathustra achieves such full-blooded sonorities so effectively. “The most difficult thing in writing for orchestra … is when all 100 musicians are playing, especially if you’re trying to do something textual or using counterpoint,” said Salonen. "Strauss does an incredible job of that. Thanks to his subversive sense of humor, Salonen might seem to be more radical than he is. But moments in his performances that seem like great strokes of originality are often based on score markings that have been hiding in plain sight for a century or so. When passages you’ve heard a zillion times emerge with so much clarity that you think, “So that’s what it’s saying,” you’ve experienced the Salonen trademark. Even looking at the big picture, he assembles the puzzle pieces in ways nobody else thought to. The longer he conducts Bartok’s lurid dance score The Miraculous Mandarin — which is on his Philadelphia concerts — the more piercing and aggressive the wind instruments get. When emerging in the early 1980s, Salonen was one of the first conductors from Finland to have an international career. With his limited English and shoulder-length hair, he guest-conducted across the U.S., but clicked with the Los Angeles Philharmonic, which had a history of grand old men but benefited from a quick-learning conductor who looked like the younger, untapped audience that the orchestra needed to attract. A few years into his music directorship, which lasted from 1992-2009, critics were talking about the symphonic nexus of the U.S. moving from East Coast to West Coast, thanks also to Michael Tilson Thomas in San Francisco. Though he could, at this point in his life, scale back conducting, he seems too gregarious to lead a less-public life. His pre-concert talks feel like stand-up comedy. And unlike many musicians fixated on the future, Salonen strongly believes in the symphonic past. Thursday through Saturday, Feb. 14-16, at the Kimmel Center, 300 S. Broad St. $44-148. 215-893-1999, www.philorch.org.